I was recently asked by one of our VP’s to investigate a way for people who are at a remote location to participate in a presentation at our corporate office. My first thought was video conferencing, but video wasn’t necessary because participants didn’t need to see each other. The only real requirement was to see the presentation slides and hear the presentation audio. Since we have a Cisco Meetingplace server I figured that would be easy. The challenge was the VP wanted the presenter to be heard clearly and not have to speak directly into a phone. He suggested we find a wireless lapel mic. After looking at the 7937 product data sheet it noted that the phone supports "a third-party lapel microphone kit". I assumed this was a Polycom product since the Cisco conference phones are made by Polycom. I opened a chat session on Cisco’s website. Both a Cisco agent and his supervisor said they didn’t know how the lapel mic worked. They also didn’t know where I could get one. They recommended I call our Cisco reseller. I called our reseller and their voice practice lead did some research. They found out from two people at Polycom that their wireless lapel mic would not work with the 7937. I contacted Polycom directly and they confirmed this. Cisco told the reseller that they could not verify that anything from Polycom would work with the 7937 conference phone. At this point it seemed really odd that Cisco’s data sheet states that the phone supports third-party wireless lapel mic kits, but neither Cisco nor the manufacturer of the phone knew where to get them. I contacted another reseller that we work with and they said that the Polycom wireless lapel mic would work. I verified that if it didn’t I’d have the option to return it since it’s almost $400. Once he confirmed we could return it if it didn’t work, I placed the order. I received it this morning and it's pretty straightforward to put together. 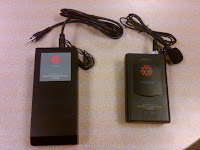 It consists of a transmitter with a lapel microphone that takes a 9V battery and a receiver with an RCA connection and antenna. The problem at this point is getting the RCA connection into the 7937 phone. The phone contains two types of microphone inputs. One of the inputs is a proprietary Cisco connection for two wired mics. We didn't purchase these as it was an additional expense and when we've purchased them in the past on the 7936 phone we ended up not using them. It wouldn't really help in this situation anyway. The other option was a 3/32" jack similar to what's on some cell phones. This was hidden behind a door on the bottom side of the phone and had some obscure drawings next to it trying to explain what it's for. The best I can tell is the drawing is trying to illustrate that this jack could be used for input or output, but I haven't tested the output portion or found any documentation on it. To get the RCA connector to plug into the 3/32" jack I headed over to Radio Shack. Unfortunately they didn't have a converter that would convert RCA to 3/32" so I had to get two converters. I'm going from RCA to 1/8" and then from 1/8" to 3/32". I'm sure if I had more time I could have ordered a cable that would have 1/8" on one end and 3/32" on the other end so I wouldn't need any converters and wouldn't have to use the RCA connector that came with the microphone. Since the converters were under $10 I decided to go ahead and try this route. Maybe down the road I'll get a cable so we don't have to worry with losing these adapters. I connected all the adapters up and plugged in the receiver. I clipped the transmitter to my belt and clipped the lapel mic to my collar. I placed a call to my coworker and it worked! He could hear me loud and clear. I went for a walk around our floor, out to the break room, and into a wiring closet. He could hear me the entire time even though the antenna on the receiver wasn't even extended. Also, I didn't have to look down at the microphone. Just talking with my head held normally he could hear me great. If anyone from Cisco or Polycom is reading this, the Polycom wireless lapel mic (Part #2200-00699-001) does work with the 7937. It doesn't directly connect, but after an RCA to 3/32" jack adapter you're in business. It was very helpfull, I'm in a very similar situation! Thx! Thanks for providing the details, I have a similar requirement & that's what brought me to this post.I had similar experience with our cisco contacts not being aware of what External wireless MIC it supports & how to integrate them. Thanks for taking the efforts & helping all of us. Thanks, this is great. We are just about to purchase the Cisco 7937 as well and were interested in this feature. We have a couple of wireless mics for various uses. One thing I'd like to note is that, since the 7937 takes a standard audio input, you probably could purchase any 3rd party wireless mic. $400 for the Polycom sounds a bit expensive. I have no idea as to the quality compared to more inexpensive microphones but this an option. The only draw back is that the wireless mic is only one way. While you may be able to roam around the room the phone is still the only speaker, so hearing the callers on the other end may be difficult. I wonder if the little picture means it can use a two way audio system rather than simply a microphone or a speaker. That would be pretty great. Here's another interesting idea. You could output the audio of your computer as well. There is probably limited use for this, but if there is audio on a computer that you would like to play over the conference, such as a voice mail you want to reference, you could probably pipe the audio directly from the output on a laptop to the phone. Just a neat idea. Both of those are good points Matt. I went with the Polycom because they make a lot of Cisco phone products and accessories (including the 7937 itself) but I imagine you're correct about using other lapel microphones. Totally AWESOME. This article solved a big problem I was having getting audio in to a WebEx meeting. Presenter was walking around in front of a group and we were using powerpoint for the presentation. 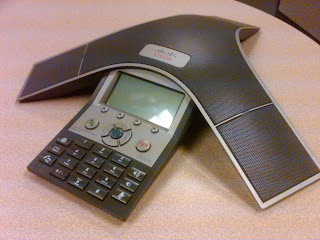 Problem was, how to get GOOD audio into the Cisco Unified Communications phone system! Awesome. I am going even further and ordered an 8-channel lapel mic system to hook up to a 7937, so that we can have wireless mics throughout a large training room. Once you plug in a mic into that jack, do the internal 7937 microphones continue to work? Or does it mute out those internal microphones? That's a great question. I would expect it to mute the internal microphones, but it doesn't. They do stay activated and work well with the external microphone connected. Additionally, the mute button on the phone mutes both microphone inputs. My suggestion is that a table top conference phone was not designed to interface with microphones and overhead speakers, which is why it shouldn't be used that way. The professional DSP's used for this application have high powered DSP(s) and software that remove echo per microphone input. If you connect an 8 channel mixer you have none of that. While the speaker in the unit isn't bad, it's not as good as overhead speakers. We have been installing BSS systems using the headset interface of IP phones and it works great (no I don't work for BSS). Help!!! 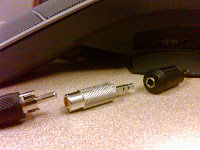 I can not get the wireless mic to work.....i have the adaptors. i may have a faulty transmitter. not sure. any tips???? I would try to test the wireless mic outside of the Cisco phone setup. Make sure you have a working wireless mic before attempting this setup. If you have all the correct plugs to physically connect it then it should work fine. Let us know what you discover. Thanks for the post..I'm in similar situation and got this post. when I went to Polycom Web for the product, found it's of two frequecy. Which one should I choose. I will use this mic with Cisco 7937G also. I wouldn't think that would matter. That's just going to be the wireless frequency that the lapel microphone uses to communicate back to the base that attaches to the phone. That would only come into play if you had two microphones that you wanted to keep separate or if you have other wireless devices in use that could interfere with it. I hope this helps. NICE! THANKS FOR THE POST! I THOUGHT THIS WOULD WORK BUT WAS GLAD WHEN I FOUND SOMEONE THAT ALREADY TESTED IT! THANK YOU!!! Thanks for such detailed information. This is definitely gonna help me. If you're referring to being able to connect external speakers to the 7937 phone, that's not an option. 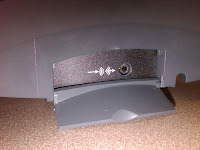 You could connect external speakers to the lapel mic though by using a splitter before the mic base enters the phone. I hope this helps. Thank you for posting this. I'm surprised to find so little information about this port. I tried connecting the sound output from a computer to this port but got nothing. If it takes generic audio input, it seems like it should work. I checked the output port on the computer with regular headphones it there is sound coming out. Michael S, that's what I am trying to do too. I would like to use the conference phone for voip calls through a PC. Did you find out anything more? Anyone. 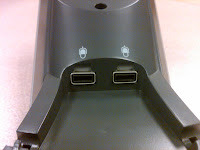 I would like to use the conference phone for voip calls through a PC using this port. Any ideas? Sorry for my late reply. I have heard of people connecting outputs from a computer directly to an input like this but have never done so myself. I'll grab my cables and adapters and give it a go soon. I'll post back here in the comments with my findings. I did exactly as you suggested and connected my laptop's headphone jack directly to this input port on the phone with the adapter and it worked surprisingly well. I was able to play music from my laptop and it come through on the phone call from the 7937 phone. I did notice that the phone isn't able to process both audio inputs as the same time. If there was noise in the room it would cut out the audio coming from the laptop and if it was allowing the audio from the laptop to come through it would cut out noise from the local microphones. Both work, just not simultaneously. This shouldn't be a problem though as long as you don't have two people trying to talk over one another. The other thing to keep in mind is the VoIP call happening on the laptop would output it's sound to the 7937 phone but input would still use the microphone on the PC. So make sure the phone and PC are really close together so the sound from the 7937 phone can be picked up by the microphone on the PC. You've mentioned you've already tried all of this and it didn't work. I would suggest you try a different PC if possible and maybe a different audio cable. I was using a Lenovo X1 Carbon laptop and a regular audio cable with no microphone support. I hope this helps. Does it make a difference if the 2.5 adapter plug into the 7939 is a mono or stereo type plugged? If you want the best washer, you get a front loader. If you want the best front loader you get an LG. And if you want the best LG front loader, you get this. This is LG's 5.2 cu ft mega capacity washer. It's definitely known for its capacity, but today in addition to that we're going to take an in depth look at some of the other features that LG has implemented and see if it's worth the hefty price tag that they require. This is a brief comparison video of the Otterbox Commuter Series versus the Otterbox Symmetry Series for the iPhone 6. I've been a huge fan of Otterbox cases for years because of the protection that they provide for the cost. Other cases will offer more protection or cost less, but not at the same time. Additionally, some of the Otterbox cases that they've begun to offer in the past few years offer great protection with little bulk. I was sold when I watched YouTuber MobileSyrup repeatedly throw his phone down the sidewalk and road with no damage using a relatively thin Otterbox Reflex case. The other huge plus here is I got my iPhone on launch day and both of these cases were available for purchase that day. Watch the video below to see which case I think wins out between the two and why. Please consider purchasing these products through my Amazon affiliate links. It's the same awesome Amazon price and experience for you and it helps me to keep making thorough reviews by paying me a commission.